The crochet is always updated and has become since when it returned to be used more again, a vintage piece and some pieces that leaves the look with more style and personality when dressing. Crochet is a type of craftsmanship that is well known and practiced by several people of all ages, done as a hobby or also as work for people who do to sell their pieces and have an extra income in addition to the practice of doing the crochet have several other benefits. It is a simple but rewarding practice that is good for health. Crochet blouses have been in existence since the 1990s and to this day there are pieces of crochet for sale and in the women's wardrobe. People used to make their own clothes like blouses, skirts, and period pieces. It is a fashion that reaches all social classes for years, also used crochet in jeans jackets plus overcoats, crocodiles and crochet and even crochet sets as skirt and crooped at the same time. Today the crochet is more modern, as time has been adjusting with fashion but it has still been used and not only in clothes but in many other things for home and decoration. Crochet can be used at any time, there is no rule to use a piece that matches the season because there are crochet pieces for all occasions. Today the pattern I leave for you is very beautiful and useful, I'm sure you will love, I will share this beautiful crochet blouse that I left in the photo above for you to learn and do. Crochet blouses can be worn on any occasions, they are very versatile. Some patterns of blouses when ready look like true works of art, just like the one I've separated for you in this post. This pattern is suitable for both casual and festive use. To leave more formal you can put a large collar or depending on the occasion put a overcoat or shawl on top. There are types of crochet blouses that are longer, others shorter, top or even the croopeds that exist in different models, some with sleeves or vines looking gorgeous with high waist pants. Crochet always adapts and never goes out of fashion, on the contrary, it is always renewing itself. Enjoy this pattern and make pieces of the colors you prefer and please everyone and if you want to give someone a gift. Making crochet pieces is inexpensive, never going out of style and can always renew if you need to just make a few details or different points or some techniques and will already renew your piece. 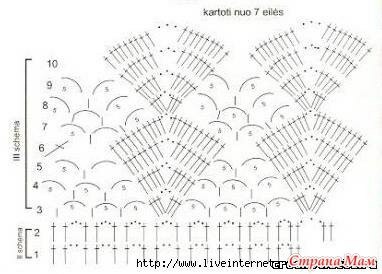 Below is the graph of how to make this beautiful crochet blouse, pay attention to the points count so as not to get lost and miss the job. Make beautiful patterns and please everyone, do not forget to enjoy our fanpage Xell Crafts and learn about our news. Until the next pattern.